I have a walking stick I use when we walk on nature trails. 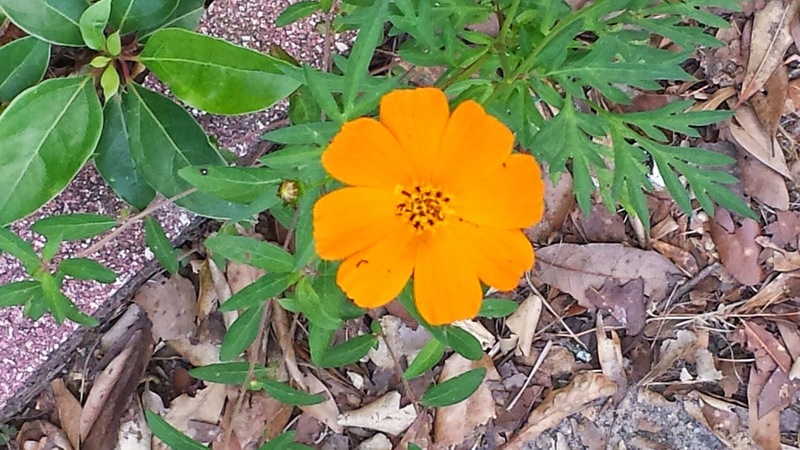 Glen picked it up for me when we were walking the mountain bike trails at the University of South Alabama. I stripped the bark off it and sanded it down until it was smooth. The stick as several purposes. It keeps me steady when I don't see roots crossing the path, it helps me when I have to go downhill -- acting as a third leg. It helps propel me up when the path goes uphill. I can use it to move branches and limbs away from my face. Some have even used their sticks to remove snakes from their path, but fortunately I haven't had that opportunity, yet. There are other times I use a stick, too. When I take our dog, Sparrow, outside she sometimes likes to dawdle in the yard. Being a beagle she feels compelled to sniff every blade of grass. That's when I gently touch her behind with a stick. She gets the message it is time to go inside and hurries along. Thy rod and Thy staff they comfort me." The Scriptures speak of the Lord's rod and staff comforting us. When I read this, I think of carrying my stick while walking. It is a comfort to me, to know it will help me keep from falling. For Sparrow, the stick is a remembrance to her that I am there, it is an extension of myself. My touch with that stick reinforces my command. Let us remember there is no path we will travel where the Lord is not present. He is there to comfort, to guide and to protect us. We need not fear the evil that surrounds us because He is with us, indeed, He is in us. and every tongue that shall rise against thee in judgment thou shalt condemn. and their righteousness is of Me, saith the LORD." Saturday June 28th, 2014 6 :32 a.m. This was an unusual walk for us because we started out early. We have a funeral today, a service at Allen Memorial and then our grandchildren coming to visit, so we had to walk when we could. Now, everyone who knows me realized I am not a morning person. (Good thing I work night shift!) The only thing that can make me move faster than a slug early in the morning is to either go kayaking or walking. The temperature was very pleasant this morning, but it was quite humid. Originally we planned to walk to Starbuck's and back, but once we got there we decided to go ahead and walk to Cream & Sugar. Along the way we saw a family walking along the other side of the street. It turns out they were old friends of ours. . .he was our Sunday School director before we were even married and she was my high school English teacher. One of Glen's favorite houses. After sharing a cup of cheese grits, we headed home. Along the way we passed one of Glen's favorite houses in Mobile. The walk home was pretty with the low temperatures and consistent cloud cover. Even our "hot spot" wasn't too hot. We took a nice, long walk today. We stayed down Florida Street, then to Ashland Place. We stopped at 3.5 miles, at the little Memorial park on Old Shell and ate our snacks. Glen had poured some sweet tea into one of the water bottles and that was very nice. Then we walked down Dauphin Street to Broad Street, to Augusta Street and on to Cream & Sugar to have lunch, which made 7 miles. We shared a delicious grilled cheese sandwich, then we headed home. It was warm, but not miserable because there was a nice breeze blowing. One sad thing we saw was that the old Krispy Kreme had been torn down. Often when returning from a kayaking trip we would stop for a couple hot donuts. We won't see the red light from there anymore. We began with the plan to walk to, guess where? Yes, Cream & Sugar. Usually we sort of snake through the neighborhoods before we get to Government Street. Today, though, we walked straight through. By the time we got to George Street, we realized we would be a little shorter on our miles, so we went ahead and walked to Broad Street. 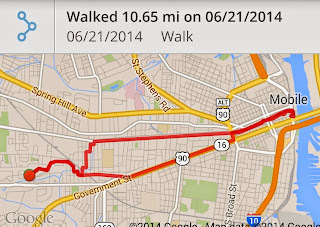 Most of the time when we take this route we go from Broad Street to Augusta, but this time we turned on Palmetto. Even though we have walked this way before, I noticed a house I don't remember seeing before. I was struck by the round room on the side of this house and the rounded tiles which covered it. At the next corner, we had reached Washington Square. I am always impressed by Washington Square, it reminds me of how many beautiful places the are in our city. A few houses down the street we saw a house with some beautiful flowers blooming. I love that about our spring-time and now summer-time walks. . .there are always beautiful flowers to see of so many different varieties and colors. We had a special treat at Cream & Sugar, our daughter Emmie met us for coffee. That made a nice treat even sweeter. It was a temptation to just have her drive us home, but we decided to press on and walk. The walk home was hot, but thanks to my new hydration pack, I had cool water on the ready all the way. The pack holds two liters of water and I had read in the reviews if it was filled with ice and water, the water would stay cool. 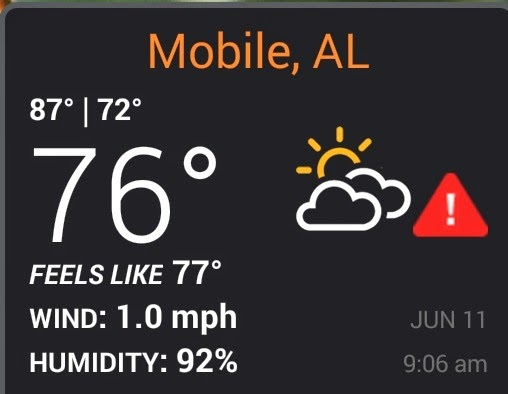 I had my doubts if that would be true in our weather, but it was. I finished the last of the water once we arrived at home and it was still nice and cool. The pack had room for everything I wanted to take and was very comfortable. In fact, it was more comfortable with this pack, weighing in at 12.5 pounds loaded, than I was with my older pack weighing 9 pounds loaded. One of the things I enjoy about the areas where we walk are all the old and historical homes. They are so stately and impressive. 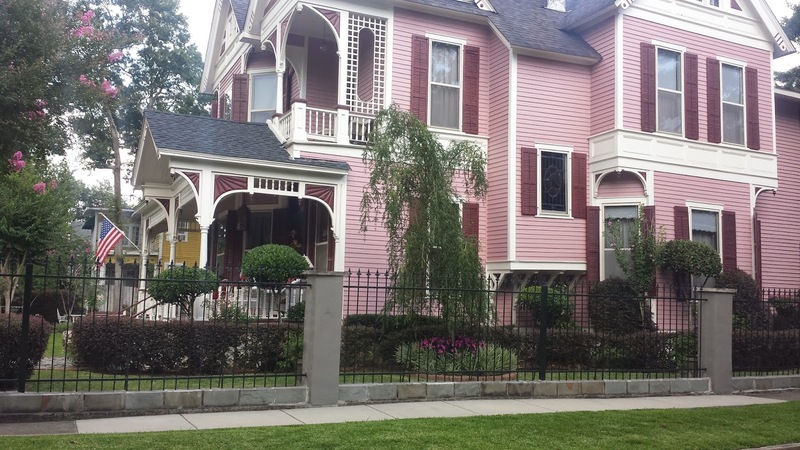 Today we walked by one of my favorite houses in all of Mobile. I love this stone house. It is on a lovely piece of property and the back of it is as beautiful as the front. We continued our walk home with a little cloud cover to break up the sunshine. Even our "hot spot" wasn't as bad as it usually is. When we were less than a mile from home, a woman stuck her head out of the window and shouted to us, "Y'all do a great job of walking!" I don't remember ever seeing her before, but we sure appreciated the encouragement. that He might be the firstborn among many brethren." In general, I don't like cloves. I don't like the smell of them or the taste of them. In fact, I find them quite bitter. But when my daughter Emmie makes pumpkin pies (and she makes the best I have ever put in my mouth) she has to add just a touch of cloves with the cinnamon and freshly grated nutmeg she uses. Without that hint of cloves, without that little bite of spice, the pies would not be nearly as good. In our own lives, the Lord knows sometimes He has to bring or allow things we don't like. He has to allow things we find uncomfortable, or painful or bitter. He knows He will work these, along with the pleasant things, for our good and for His purpose. His purpose is to conform us to the image of His Son. Sometimes that transformation can only be done with pain. He allows it, not to hurt us, but to add that touch of bad to bring out the very best in us, to make us the best pie we can possibly be. "She wanted to ascertain the feelings of each of her visitors, she wanted to compose her own, and to make herself agreeable to all; and in the latter object, where she feared most to fail, she was most sure of success, for those to whom she endeavoured endeavoured to give pleasure were prepossessed in her favour. Bingley was ready, Georgiana was eager, and Darcy determined to be pleased." Picky people cannot be determined to be pleased. In fact, they often seem determined to be displeased. To have the attitude that one is determined to be pleased, one must choose to put the desires and wants of another before their own. "Delight thyself also in the LORD: and He shall give the the desires of thine heart. and He shall bring it to pass." This reminds me of my favorite delivery in over 2800 deliveries. It was one of the busiest nights at work I had ever had. There were only five nurses and in the final count, we delivered seven babies in forty-three minutes! I was rushing to prepare a new patient for delivery in what we affectionately called, "the cubbyhole". Its name fit it well, because it was merely an indentation in the wall, big enough only for the bed and a bedside table. A curtain gave a small degree of privacy and I stood behind this curtain trying to find out something about this woman before her baby made its hurried arrival. She had done this many times before and her body certainly remembered how because her labor was progressing rapidly -- the baby would be here in a matter of minutes. It was then that I heard the soft comment, "I've got to push." It wasn't a shout for help, it wasn't a cry. It was spoken softly, quietly, almost as if she had spoken it to herself. And it wasn't spoken by my patient! Where did it come from? There were no patient rooms on this hall, only this cubbyhole! For a moment I thought I had imagined the whole thing. Perhaps even, if I ignored it completely, it wouldn't repeat itself! But I had heard it and I had to search for the owner of that softly spoken voice. The only other room on that hallway, besides the closed operating room, was a small closet in which the anesthesia personnel kept their supplies. There were bottles of liquid anesthetics, supplies for all types of regional anesthesia and shelves and shelves of epidural trays. Barely fitting in this dark and dusty closet was a stretcher upon which was a very pregnant woman. Her eyes latched onto mine with urgency as I passed through the doorway. She softly repeated the phrase, "I've got to push". I quickly asked a few questions while reaching for an exam glove…Who was her doctor? A private doctor who would take twenty minutes at best to arrive. Was anyone with her? Her husband was still on the first floor completing the admission paperwork. She told me she would like a birthing room, which was the very opposite of this dark closet. When she told me she would like an epidural, I almost bit my tongue to keep from telling her that the epidurals were on the shelf right beside her. As examined her to determine the status of her labor, I was met by the fleeting, puzzling thought I always seem to have when my fingers meet with a hard obstacle in such a soft place. The baby's head was right there. There would be no birthing room; there would be no labor coach, no epidural, not even a doctor - all of the resident obstetricians were in deliveries. This baby was coming with the next contraction. I ran to grab an emergency delivery pack and headed back to the anesthesia closet. An eager, or perhaps only curious, medical student followed me back to my patient. With more deliveries under my belt now than I could count, I had full intentions of letting him do this delivery. I asked him "Have you done many deliveries?" He answered, "Well, I've seen one." By the tone of his voice I had the distinct impression he hadn't paid too much attention. "Okay then," I said as I quickly decided, "You will help me.". As I opened the delivery pack and prepared my instruments, I prayed that this woman would deliver as easily as she had labored. With the next contraction, the baby made its entrance into this world almost effortlessly. After cleaning out the baby's nose and mouth and guiding the shoulders through, all the while explaining to the wide-eyed student what I was doing, I wiped down the baby and gave it to the mother. It was easy to tell it was love at first sight. The whole process had only taken a few minutes by the clock, but it had seemed if time had stood still while this baby was being born. I felt so sorry for this woman that all her expectations had not been fulfilled and I as I wheeled her to the Recovery Room, I told her so. "You didn't get a birthing room, your husband, an epidural or even a doctor." Then she replied with a sentence I will never forget. "No, but I got the most beautiful baby girl in the whole world!" Tears came to my eyes as I marveled at her wisdom and realized that this woman knew what was important; she knew how to extract the essence of life out of the situation. And to this day her delivery is my most memorable. It was not memorable for occurring in a finely decorated birthing suite, nor because of the beauty of the relationship between husband and wife, although I have seen that type of delivery. 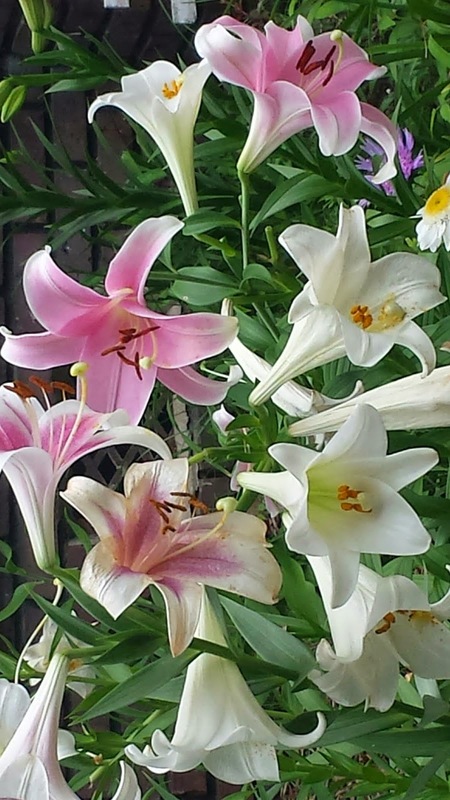 It was not memorable because of the skill and caring of an experienced physician, yet I have seen those as well. It was memorable not because of the bond between nurse and patient, in fact, I can't even recall her name and I doubt she ever knew mine. It is memorable to me, however,even after all these years because of a mother's love for her child which was great enough to transcend the meager surroundings, the absent support and the inadequate staff. She was determined to be pleased. When we delight ourselves in the Lord, when we commit our way unto Him, we are valuing His desires, His will and His way more than our own. When His desires become our desires, we find ourselves determined to be pleased and He will bring those desires to pass. 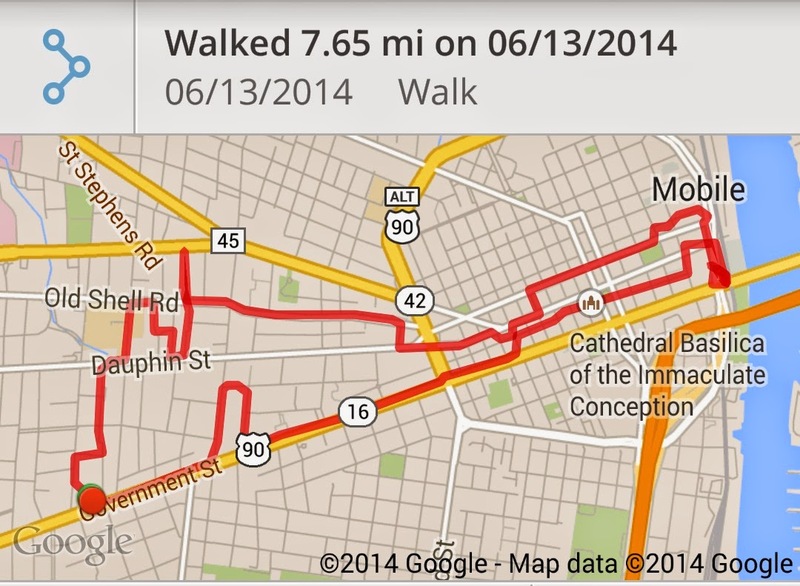 Today was going to be a shorter walk. We didn't get started until late and because I am working tonight, I needed to have time for a nap before work. 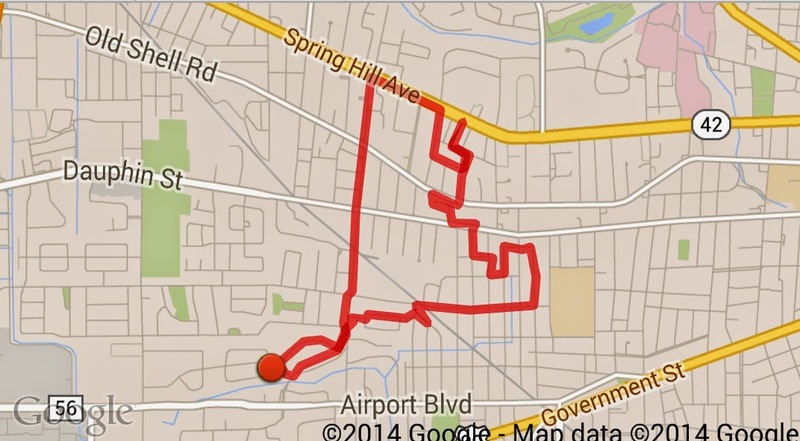 We decided to walk the 2.5+ miles to Starbuck's and then turn around and go home. When we started out my first impression was it was really, really hot. I was so thankful when a little cloud cover have us a break from the sun. We shared a cup of coffee and then left the air conditioning for the hot asphalt. Our "hot spot" lived up to its name today. The cloud cover was there for a bit, but there was also lots of sun. I always bring plenty of water so that helps. I also bring a mineral replacement drink (thanks to the nice folks at White Blaze for the recipe) which is a nice treat along the way. I never thought I would look forward to a drink made with potassium, salt and sugar, but I do. When we got home, I had the nicest surprise. My new hydration back came today. I haven't had a chance to wear it yet, but this pack is so well made -- it has so many features which are just plain thoughtful. I'll share more about it after I've had a chance to put it to the test. But if this is the way Kelty makes everything, I am definitely looking at them for my backpack! Although the temperature was way down for this walk, the humidity was way up. We are in the season where we have a shower almost every day and while this lowers the temperature, it does tend to increase the humidity. Glen has a cold and my tennis elbow has flared up badly, but we decided to walk anyway. We had wanted to walk earlier, but the weather deterred us. Our plan was to go three miles out and three miles back. That usually puts our midpoint near the Starbucks on Catherine Street. Once we got there, we felt good enough to continue on the extra mile+ to Cream & Sugar. As we were walking, we began discussing some tee-shirts Emmie was going to make for us. Glen decided we should have our names on it. Since we were nearing Cream & Sugar (our most recent "favorite" coffee shop) we thought that would be cute with Glen being "Cream" and me being "Sugar." On the walk back I got to thinking about that (partly to distract me from the burning pain in my elbow.) I began to think of variations of Cream & Sugar and came up with Crea Man & D'Sugar. The letters are the same, but are separatedly differently. Almost immediately, Glen began calling me D'Sugar. 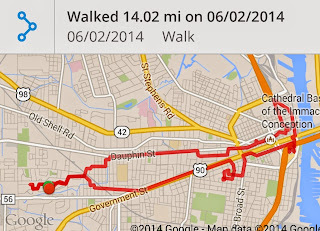 The walk back was pleasant and I was glad we ended up with 1.55 more miles than we originally planned. Glen and I have been walking together for six months now. Actually, Glen has been walking for quite a while longer, but I only joined him in January. I passed the 700 mile mark last Saturday and he is past 2000. Our walks have gotten progressively longer and we hope to one day section-hike and even thru-hike the Appalachian Trail. 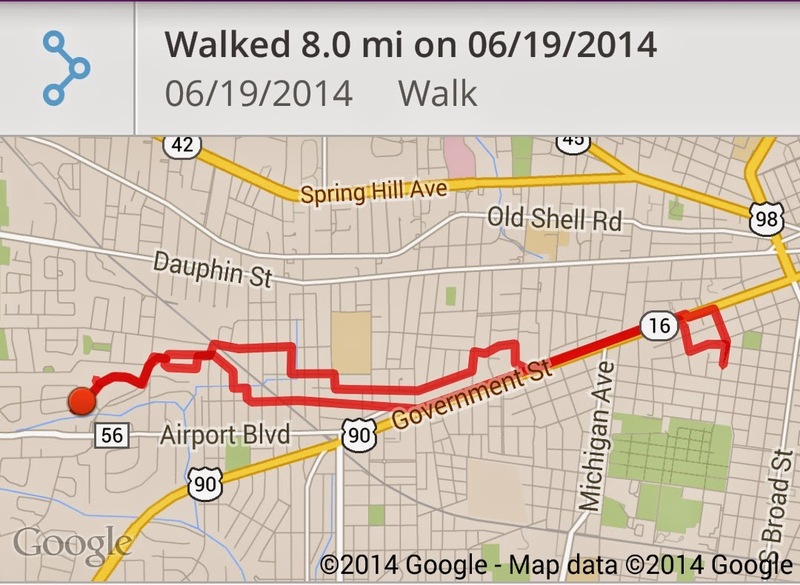 In May, I began journaling our walking experiences, mainly for my own records. I have decided to add them here if anyone would enjoy reading them with the label, Crea Man & D'Sugar. You may wonder about the label. Our walks are often punctuated by a stop at a local coffee shop called Cream & Sugar. We will walk several miles, stop for coffee, and then continue our walk. Especially in the summer, a break for a few minutes (in the air conditioning) is quite refreshing. It is amazing how those few minutes of rest can regenerate your legs. We began talking about names on some tee shirts our youngest daughter is making for us, and we immediately thought of Cream and Sugar because our love at stopping at coffee shops while we walk. Crea Man & D'Sugar is Cream and Sugar, just separated a little differently. Ironically, neither of us like sugar in our coffee. Rarely will we do without the cream. When Glen and I walk, he is navigation and I am procurement. Early in our walking together, we would each come to a street crossing and crane our necks around each other trying to see if it was clear to cross. We didn't always agree on this, so often, there were many missed starts, hesitations, and needless waits. We finally decided that Glen would be the one to check that the way was clear and to communicate this to me. This system works almost flawlessly for us and is how he became "navigation." About the same time our walks became long enough that I found it necessary to carry a pack. I carry the pack, first of all, because it is my pack. I also want to make sure that I always have in it what I want to have available. This is how I became "procurement." My goal with the pack was to gradually add weight to help make me comfortable with a backpack for hiking. My pack has gotten heavier with time, especially as we enter summer and find it necessary to carry more water. On a long walk, I am ready to drop the pack as soon as we get home. Usually it is the first thing I do, dropping it on the kitchen counter. While I don't find it difficult to wear while walking, as soon as I don't have to carry it anymore, I take it off. If I were to continue to wear the pack once we were home, or even the rest of the day, that would be fruitless, would hinder my ability to do many things, and would be just plain silly. Often times in our lives, we carry the guilt of our sins, failures and temptations like a pack. It is a heavy burden that we just don't seem to be able to slide off our back. The sad thing is, it is fruitless for us to continue to carry that weight. sat down on the right hand of God;"
There has been one sacrifice necessary for the redemption of our sins, and only one necessary. That sacrifice was paid in full by the Lord Jesus Christ. Let us believe this and trust in the power of His sacrifice. To continue to carry our packs of guilt for past sins only hinders us from fully following His will and trusting Him in the present. Praise the Lord, Praise the Lord, Oh my soul. Do You Want to Be a Sprinter, or a Gymnast? Watching the Olympics I noticed something in the way athletes of different sports responded to a set-back. If a sprinter fell during their race, rarely did they get back up on the track to continue. Most likely they believed their ability to finish the race with a good time was lost. If a gymnast fell off the balance beam, pommel horse or rings, they moved as quickly as possible to remount and continue, believing they could redeem the points lost by falling by having a flawless finish. All of these competitors are world-class athletes and they each know the ins and outs of their particular sport exceptionally well. But in terms of our spiritual race, which would we rather be, the sprinter, or the gymnast? In our Christian lives we will all face times of disappointment and failure. We will fall off the beam, or lose our grasp of the rings. The question is, do we get up again? 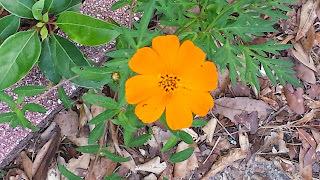 Do we quickly avail ourselves of the redemptive work our Lord Jesus has completed for us -- for both salvation and for the maintenance of our daily walk with Him -- or do we sit dejected, discouraged, deceived and distracted by our own failures? At the end of His time on Calvary, when the Lord Jesus paid the price for our sins, He cried out, "It is finished!" It that moment, everything we need to be justified in the sight of God was completed. Everything we need to walk in the Spirit with the Lord was provided. Everything for every need...all found in Him. 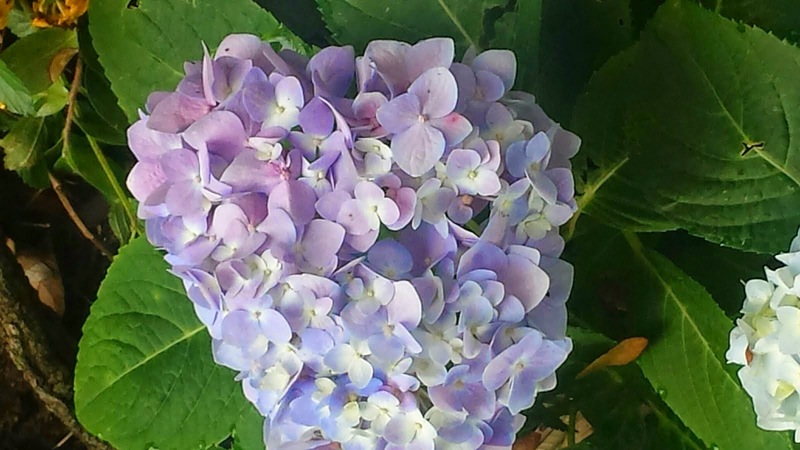 and rejoice in hope of the glory of God." When we have those episodes in which we fall, let us remember that "we have peace with God through our Lord Jesus Christ." Let us agree with Him regarding our failures and by faith believe in our access into the grace He has purchased for us. The work is finished, let us avail ourselves of it's benefits. "I press toward the mark for the prize of the high calling of God in Christ Jesus." 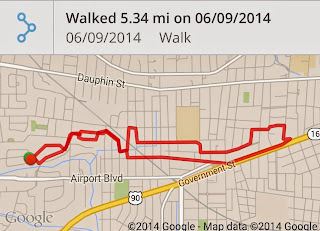 Tonight's walk was as cool and comfortable as last night's was hot and muggy. Because it was Sunday, and because of the usual summertime afternoon showers, we didn't get to walk until late, and then only for a little while, but it was very nice. 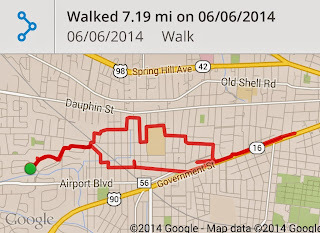 We walked to Ashland Place and back. We walk through Ashland Place about once a week. We enjoy looking at the older homes there and walking on the exceptionally wide streets. There is one old home which is in the process of being rennovated and I have enjoyed watching the progress of this restoration. I have seen a deck that wasn't there come into being and now a pool is emerging from a hole in the ground. This house will look amazing when it is finished. I splurged on myself this evening and bought a new hydration pack. 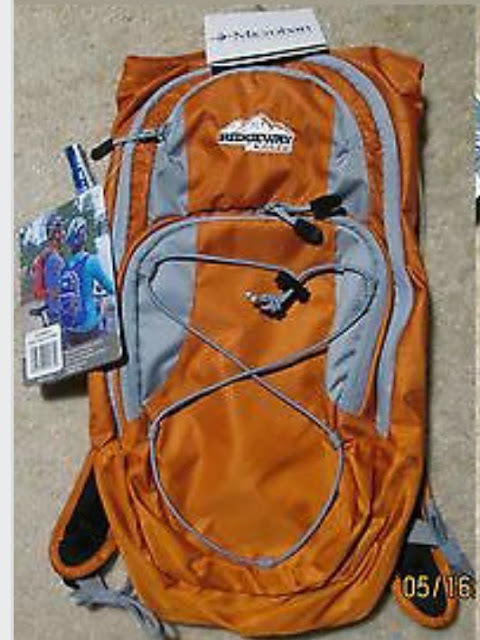 It has enough space, along with the water bladder, to hold everything I like to carry with us as we walk (sunscreen, bug spray, Frogg Toggs, snacks, etc) and I can't wait until it arrives. A new milestone, 700 miles for the year! It was hot when we started out but I wouldn't have said it felt like 109°! We were just over a mile, when out of the blue, it started to rain. It wasn't a downpour, but it was a good, soaking shower. It rained for a good while. After that, the steam could be seen riding up off the asphalt. We walked to the Convention Center and sat on the steps to eat our snack of nuts, cherries and blueberries. 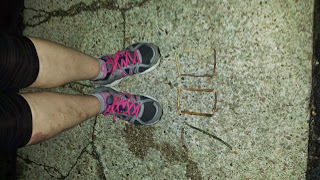 We were at the halfway point (we knew that because our goal was 10.33 miles, so I could hit 700 for the year. ) We had thought about walking the steps again, but then decided against it. On the way back we stopped at the Mediterranean Sandwich Shop for dinner. We had not gone very far after eating when we felt a fine mist on our arms. Then it became a sprinkle. Then rain. When the rain stopped, a haze came up over everything. .. it looked like smoke, but it was the humidity from the rain. It was like walking in Jello. The last part of the walk was very hot and very tiring. We had just turned the corner into Pathways when we passed 10.33. . .700 miles. 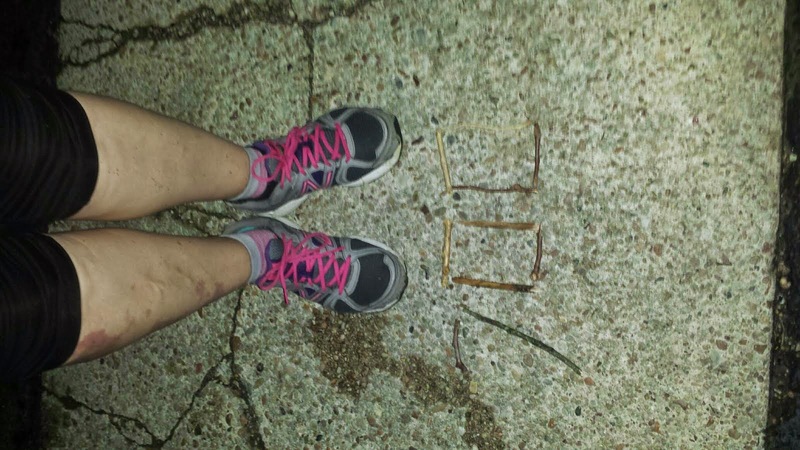 I wrote out 700 with sticks I had collected along the way and had Glen take a picture of it with my feet. Our route for this walk. Just as we walked out of the house, we noticed a dark cloud above us. Although this meant the chance of an afternoon thunderstorm, we decided to continue on and give it a try. We walked toward Government Street and at Memorial Park decided to cross over to the service station on the other side of Government Street, because they sell the great little granola bars we like. It was nice to have a treat so early in the walk, but we continued walking as we ate them. As we started back, it was noticably cooler. The breeze was even cool. It felt wonderful and I guess it was inevitable that when the cool air met the warm, moist air a thunderstorm would develop. 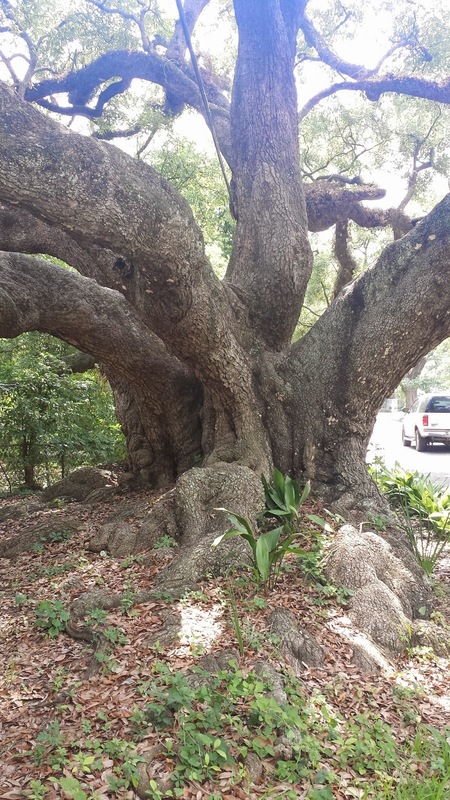 As we were walking fast to avoid the lightening, we passed what I think is one of the biggest trees I have ever seen in this town. We also passed some of the worst sidewalks. The storm was to the east of us, moving in a south-south-west direction. 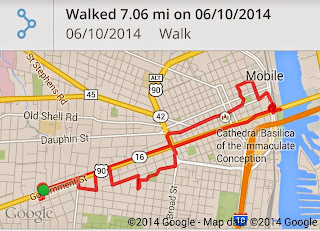 We had walked to Broad Street after leaving Cream & Sugar, then headed down Dauphin. At the old Dauphin Way (where we always remember to share a kiss, since that's where we were married) we started heading toward Government Street, not realizing the storm was headed South. It rumbled on behind us until we got to Catherine Street. We stopped at the Starbuck's parking lot to see what it was doing. When we turned to the east we were surprised to see the storm was much closer to us than we thought. We decided to duck in Starbuck's to wait it out. When the thunder seemed to be past, we headed out in the rain. It was actually very cool and pleasant walking in the rain. The rain was not hard and a nice breeze would blow every now and then. It makes me think of when we first started walking together in the winter. If it even looked like rain, I would carry my rain jacket. But in the summer when it rains it is very refreshing to feel the cool drops on your arms. However, I don't like the resulting mud puddles we must walk across, around and even sometimes, through. By the time we were close to our "hot spot, " the sun came out. I could almost feel the steam coming up off the asphalt. I was so glad my Frogg-Toggs were still frozen. It helped a great deal having them to cool things off. After our walk, I finally finished my cannibalized backpack. I took parts of several gym bags to make a new two strap bag (my current teardrop bag has only one strap and puts a lot of stress on my neck.) I finished it, and I hate it. While I won't be using it as a backpack, it was a great learning experience for sewing these types of materials. It should come in handy when I make our sleeping bags soon. We started planning to walk only about five miles this morning because of the heat, then pickup another five this evening. Although it was hot, there was a good deal of shade and cloud cover, so we decided to go ahead and walk to Cream & Sugar. 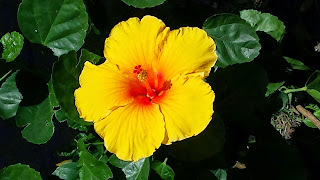 As we sat eating an incredibly delicious dreamscicle cake ball (Called Mobile Bay Breeze, and if you see it you might be surprised that it is blue) and yummy cheese grits, I noticed the sun shining brightly outside. 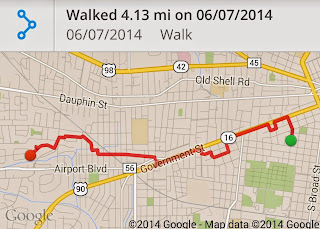 1 thought how much hotter the walk back was going to be. Actually, the temperature starting back was 89° with a FL of 101°! One nice thing about the bright sunlight, it did show off the beautiful flowers along the way. We began by driving to Starbucks at Catherine Street to park the car. Our intent was to walk to Water Street and climb the steps at the Convention Center again. As we headed east, we noticed a bank of dark clouds ahead. As we continued farther we could hear the rumblings of thunder before us. By the time we reached downtown we could see flashes of lightening here and there. We discussed ducking into a store opening and waiting, but it really did seem as if the storm was moving further east away from us. We took our chances and headed down to the Convention Center. We may have ended up with a rare drop or two on us, but it never actually rained. We reached Water Street by going east on Conti to Royal. I don't think we've ever walked east on that part of Conti before and I was struck with how different the view was, with the hotels on Royal looming above and in front of us. At the Convention Center we walked the steps, all 100 steps six times up and six times down all. The first three or four sets weren't too hard, but the last ones had me sweating and huffing. My legs never felt strained, although my knee twinged on each step. We sat on the steps once we had finished to take a water break. I had packed some frozen blueberries (which by then had thawed) and that was a very nice treat. On the walk home we passed by the Mediteraean Sandwich Shop and since it was open, we went in and ordered some orzo and a roasted vegetable & Cheese pita sandwich. 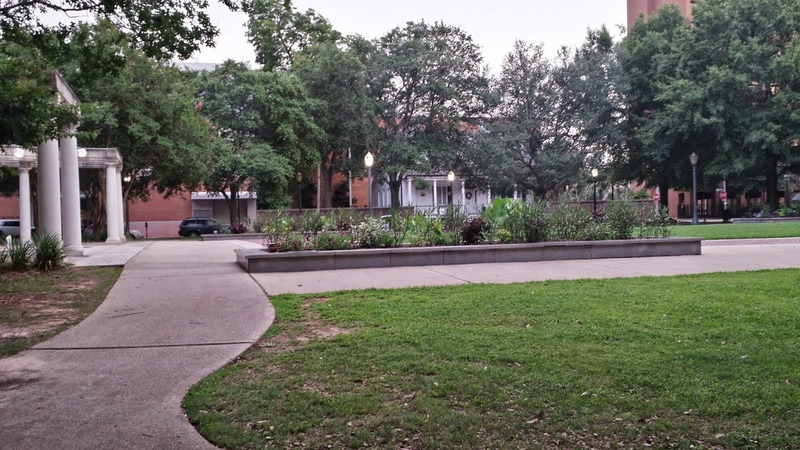 We walked across the street to Catheral Park where we sat on a bench to eat our dinner. The sandwich was one of the best things I have ever put in my mouth! We sat and watched two men play with the cutest little white puppy on the splash pad. Then it was time to pull ourselves up and go. 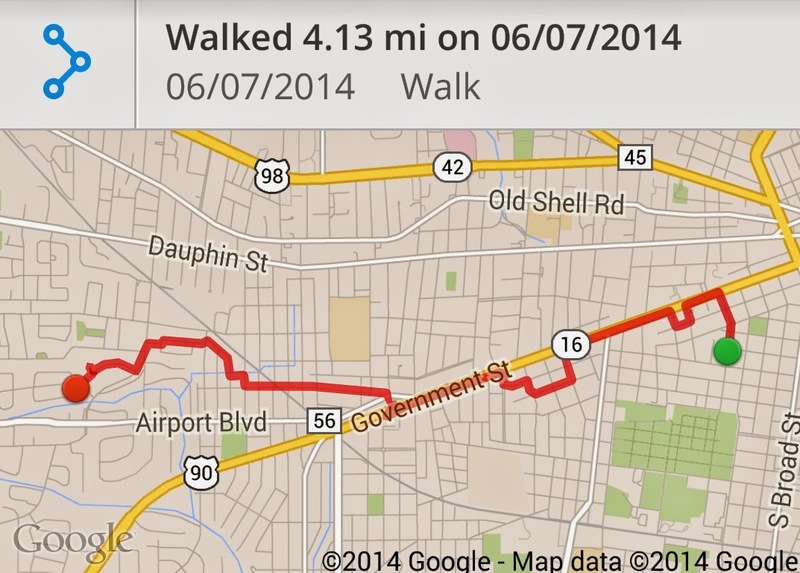 I was very sluggish at first - I think I had it in my mind we had to walk all the way home. When I realized we had only about half of that, I seemed to rally. We made 6 miles by the time we got back to the car. My GPS said a little less. It's odd, sometimes my will say more than Glen's for a while and then it will say less for a while. We both choose to take whichever one says more! 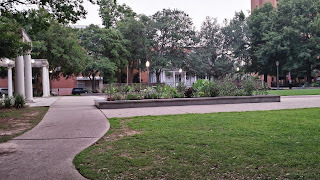 It was a very nice evening, especially sitting at the park enjoying our meal. I find I see so much more of the city when we walk than I ever have from a car. And I find walking so relaxing and refreshing...not just from an exercise and fitness standpoint, but mentally. It is nice to be quiet and still in our minds, even if our legs are moving. It's nice to observe what is around us and see the things that are usually lost to us. 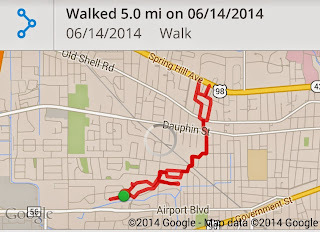 Only a short little walk today. I worked last night and have to go back again tonight, so there really wasn't much time for anything else. 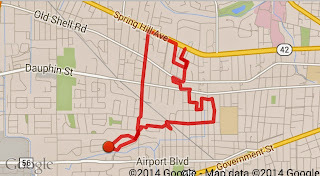 I feel pretty good that I even got ONE mile in. 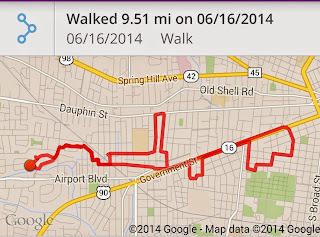 We made a half mile loop down Florida Street. As we made the turn we remarked at how short one mile seems now. 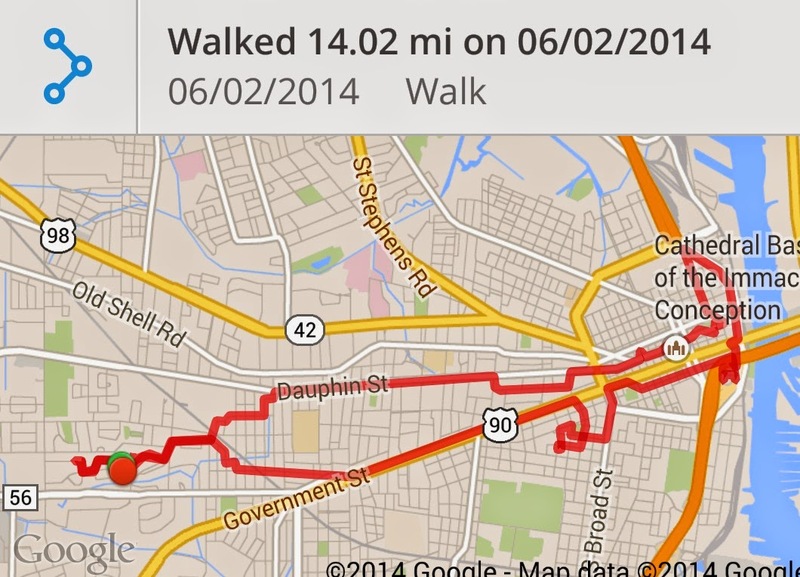 I can remember back in January when I started walking, that first mile seemed a lot longer than it does now! Our walking is not something either of us ever expected I would want to do or enjoy so much. I realized that our walking grew out of our trip to New York City. Our apartment on 5th Avenue was so perfectly located for everything we wanted to see and do, we hardly had to ride the subway at all. 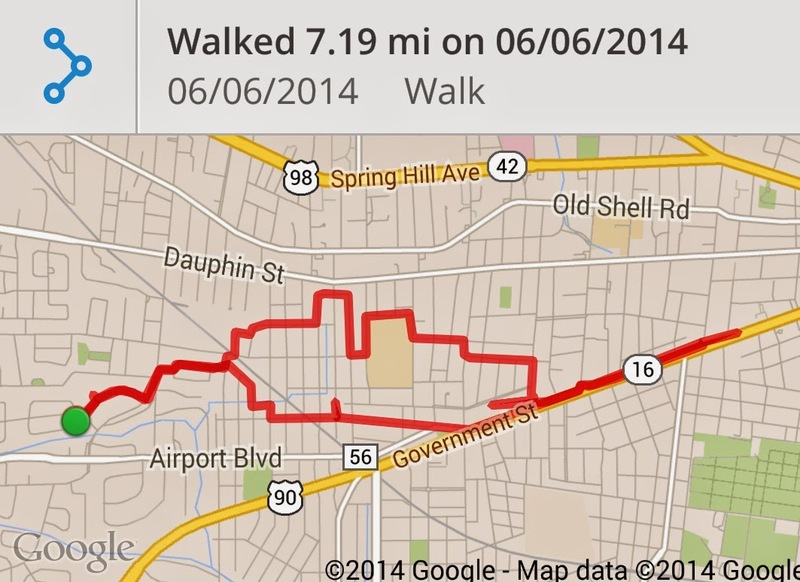 We ended up walking 6-12 miles each day. I enjoyed the walking there immensely. I think when you are walking you can experience so much more and take so much more in. When we got home, we tried walking to some places instead of taking the car. . .to WalMart, to the Post Office, to the bank, but that didn't work out as well as in New York. 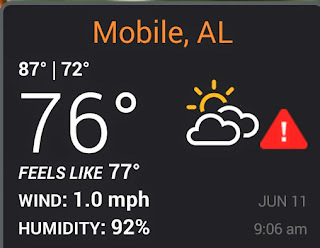 Mobile just isn't designed to walk everywhere you need to go. Still, I knew I could walk several miles at a time and I knew I could enjoy it. It wasn't until the end of January I really started walking with any consistency. By February I was doing great. Now, at the middle of June I am on my way to 700 miles for the year. And dreaming of walking 2181 in six months one day! When we started out it was 86° and a "feels like" temp of 100°. It indeed felt like 100° to me. 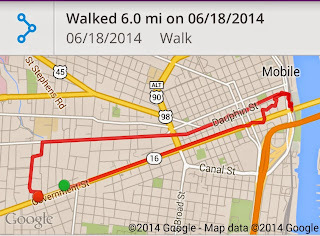 We zigzagged through the neighborhoods until we got to Cream & Sugar at 5.56 miles. I don't know which felt better, sitting down or the air conditioning. 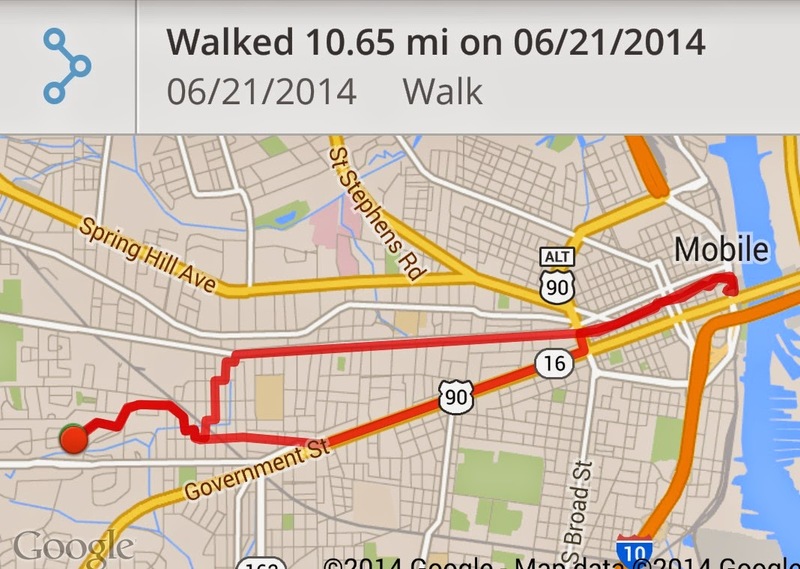 It was a long walk home, especially the last 1/2 to 3/4 mile where there is no shade at all. This is what we call the "hot spot." At the end of an already long walk, it isn't too much fun to realize we still have the "hot spot" to go. I don't know who comes up with the "feels like" temperatures, but it certainly felt hotter when we ended than when we began. Tonight I just didn't feel like walking. I was very frustrated about the sewing machine breaking and my not being able to finish my backpack. I had taken parts of several gym bags to make a new daypack for our walks. I was close to being finished when my sewing machine (which has been having problems for quite a while) just quit. It took a few miles for me to get out of my bad mood. I wasn't feeling good mentally or physically and I know I wasn't very good company. 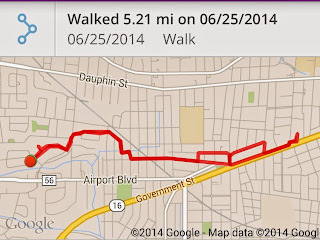 Since it was going to be a shorter walk, we walked to Ashland Place and back. 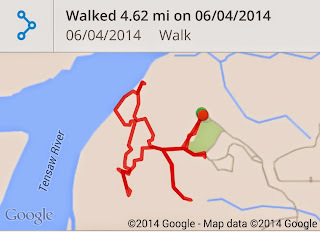 I can't imagine what a foul mood I might have been in if we hadn't walked! 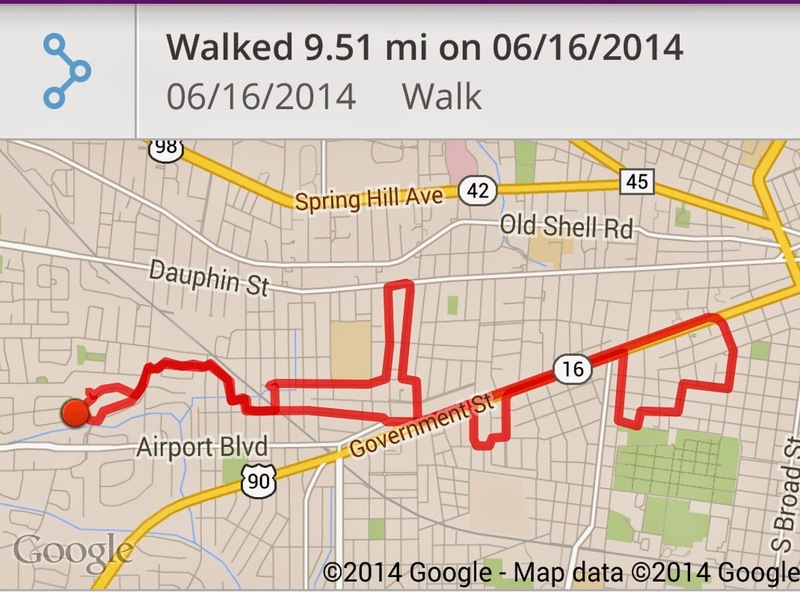 Today we walked to downtown and walked through some neighborhoods we haven't walked before. As we got downtown we noticed many streets blocked off and people everywhere. We even saw people wearing huge "people" costumes -I don't Know what else to call them. We found out all the commotion was for the Art Walk. When we got to Water Street, we walked up (and down) the steps at the Convention Center four times. There are 48 steps on one side and 52 on the other, so doing both sides gives us 100 steps. 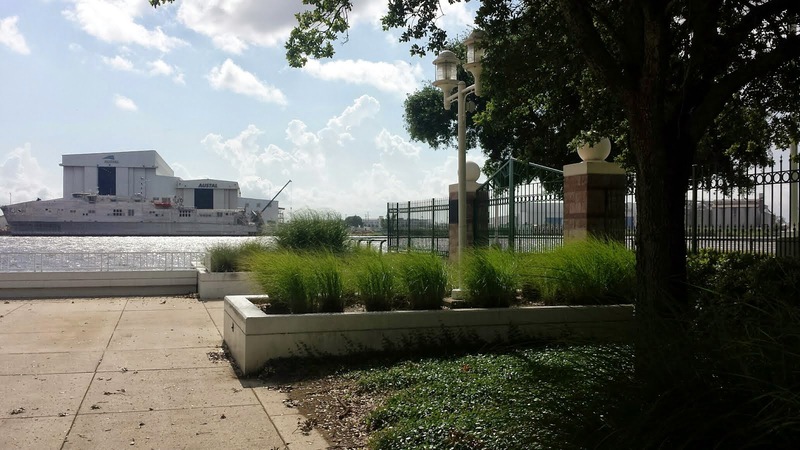 There aren't many places in Mobile with a large amount of continuous steps (or at least that we have access to whenever it suits us) so we have to make due with what we can. We didn't have much time to walk today because Glen had an appointment early in the morning. 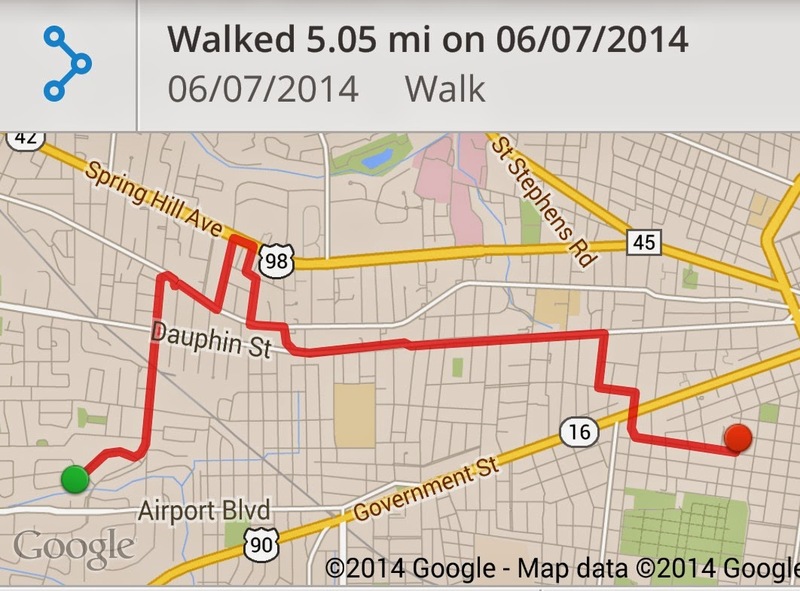 We started out with the plan of walking five miles and ended up with a little more. Today we had a different starting place. We drove to Starbucks at Catherine and Government and made our way downtown. 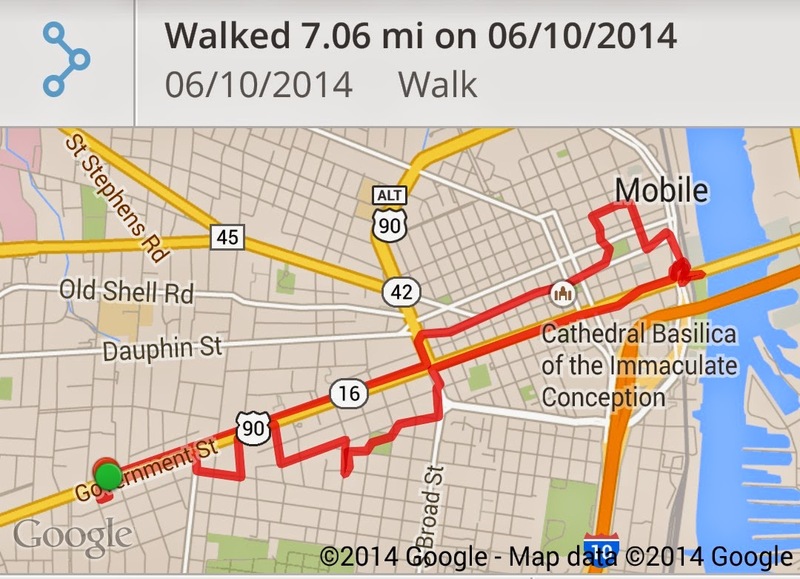 Once we got to Bienville Square, we turned down Conception Street to follow the shade. There, getting into his van was our plumber, Tony. Glen had lost his number, so it was great to see him again. His work is excellent so we definitely wanted his number. As we turned onto Royal Street we encountered the famous blustery wind whipping between the buildings. It felt good, but it blew my hat from off my head and I had to chase it down the sidewalk a ways. Let me tell you a little about my hat. When I grew up there was a Sweet Olive tree outside my bedroom. I used to love to stand at that window and smell the sweet fragrance from the little white blossoms. Later on, I moved to the bedroom across the hall and my own room became my father's study. I missed the tree when I moved away and when I visited my parents, I loved to smell that tree from my dad's study window. Then in 1997 I was given my own Sweet Olive Tree. I had been teaching a childbirth class and the subject was on things that made you feel comforted (which is quite different from being comfortable.) I gave the illustration of the scent of sweet olive and how I find that scent somehow takes me back to my childhood. At the end of the class, one couple presented me with my own Sweet Olive Tree. Little did they know that my dad had passed away a few weeks before. That tree, now planted outside my bedroom window, is a reminder not only of the thoughtfulness of that couple, but of my dad and the tree we shared outside our window. The Windmill Market is a collection of business in one place. 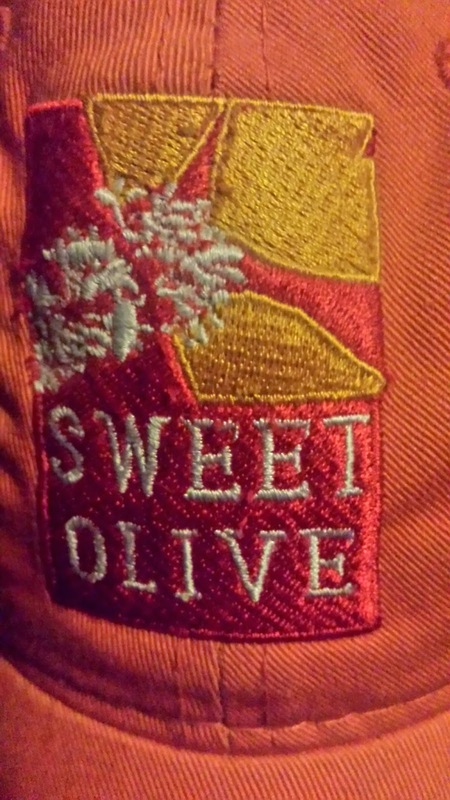 The restaurant part is call Sweet Olive, which of course is special to my heart. One thing they were selling that day in the Market were baseball caps with the Sweet Olive logo. Now, I never wear baseball caps. . . except when we kayak and when we walk. They are the perfect vehicle to keep my hair out of my face and the sun out of my eyes. The hat I picked out was orange and the logo is red, white and yellow. Orange and red are probably my two favorite colors, so of course, the hat became mine. It has traveled with me for about 300 miles now and serves it purpose well, so I was more than willing to chase it down the sidewalk. We walked down to Cooper's Park and were disappointed to see it was closed. I wanted to get a picture of me sitting next to "Mr. Cooper," as I call him, the bronze statue on the park bench. I was going to put my hat and sunglasses on him for the picture. We took a short break and decided to walk up the steps of the Convention Center. 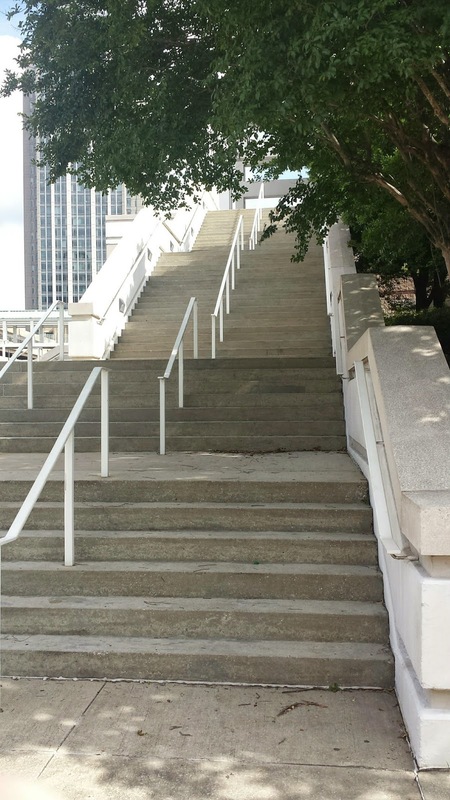 We have been looking for stairs to walk up to strengthen our legs, and there aren't many in Mobile which have access whenever we have decided to walk, so we've made a plan of walking these with increasing numbers of repetitions at least once a week. 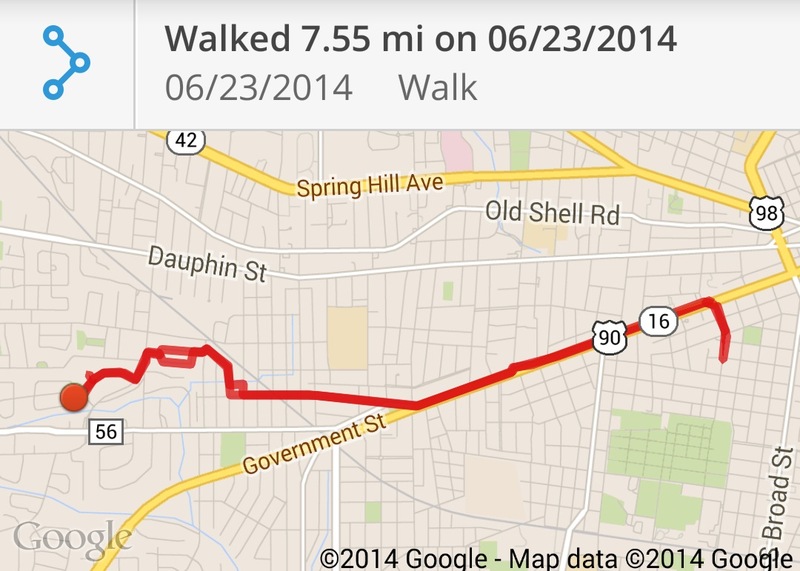 The walk back seemed significantly hotter, I suppose because there was less cloud cover. It was very nice to realize we only had to walk back to the car, not back to the house. We walked this evening because I worked last night and had to sleep some today since I am on-call tonight. 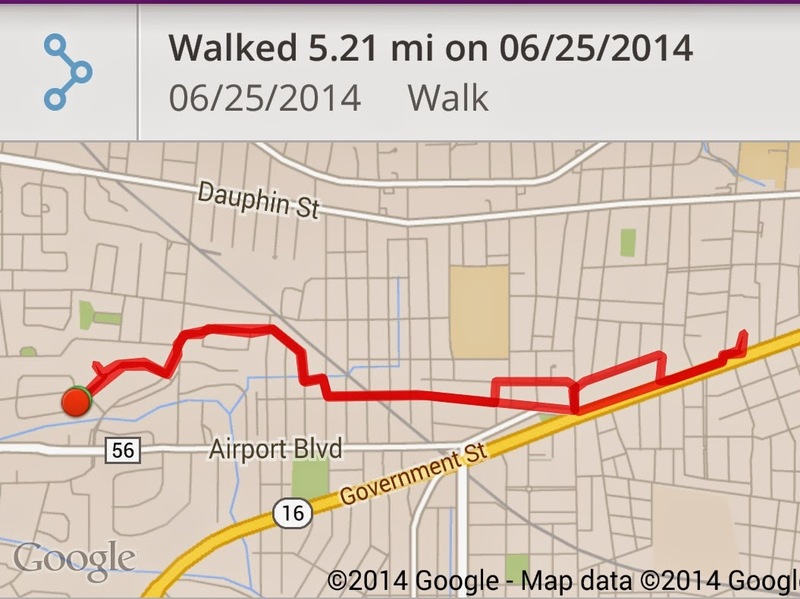 We decided starting out to walk about five miles and we went a little more than that. We couldn't go much farther because I had to be available for work within 30 minutes. We walked through the neighborhoods to Catherine. We decided to stop at Starbucks and have a cup of coffee. Sitting in those soft leather chairs in the cool air conditioning was so nice after walking out in the heat. 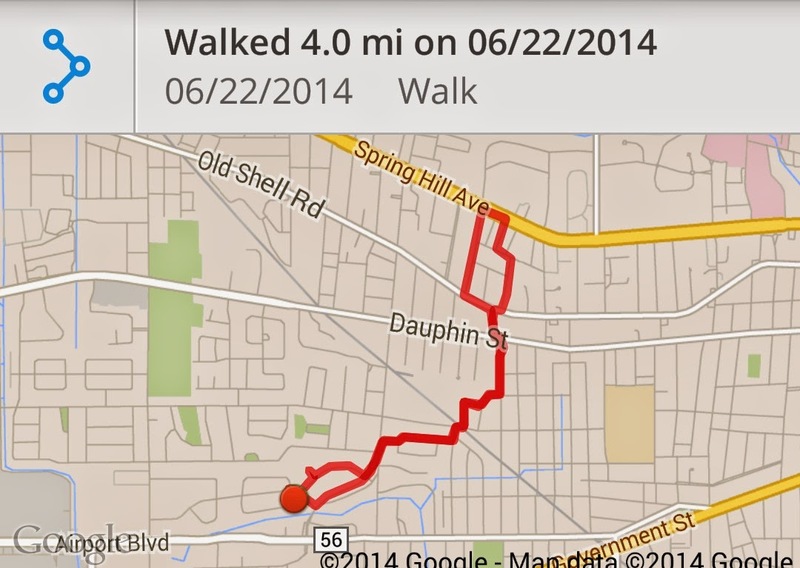 What a hot walk! By the time we finished our 9+ miles, the "feels like" temperature was 106°. 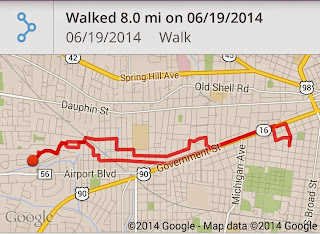 We had only planned to do about eight miles. We stayed down Florida Street and went through Ashland Place. Then we came back to Dauphin and headed East. At Ann Street we crossed Government Street and headed to Cream & Sugar. We were over 5 miles when we made it there. 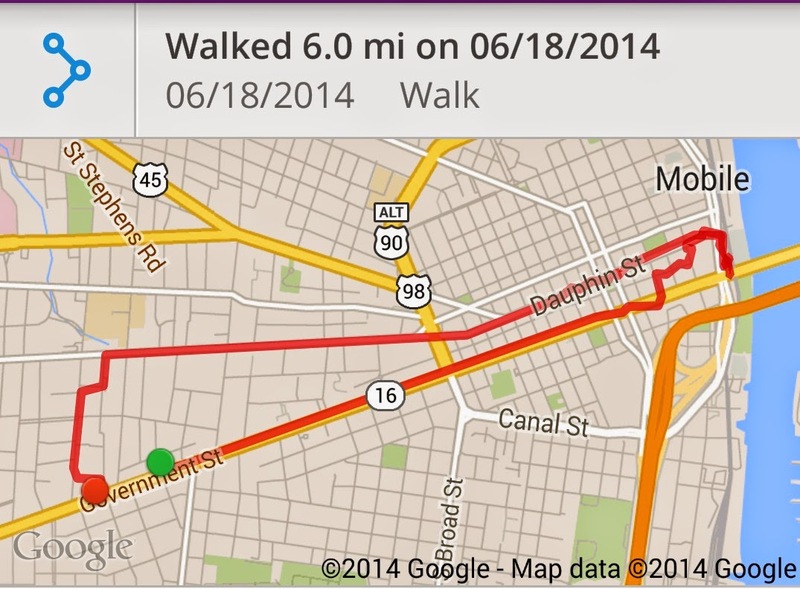 When we left, I hit the wrong button on my walking app and closed out the workout. That's why there are two pictures of our map. . . one is to C&S and one is home from there. At about 7 miles I was really feeling the heat. I was so glad when Glen suggested we stop for a few minutes at Memorial Park. We sat under the shade of the blooming Magnolia trees and ate a snack. We joked about how it was going to feel when we got to "our hot spot," the last leg home where there is no shade at all. Fortunately, there was some cloud cover during that time. We walked down Government Street until we reached our halfway point, which was across the street from the home of some friends of our. Then we sat on someone's sidewalk steps and ate a snack of walnuts and granola and drank sweet tea and water. Sweat was pouring off of me. I was surprised we ended up with over seven miles because our "halfway" point was only 3.10 miles. Somewhere along the way back we added more mileage. I don't think the walk might have seemed so hot and long if I hadn't worked the night before or if I hadn't had a headache when we walked, but then again, it is June. This was really an adventure! 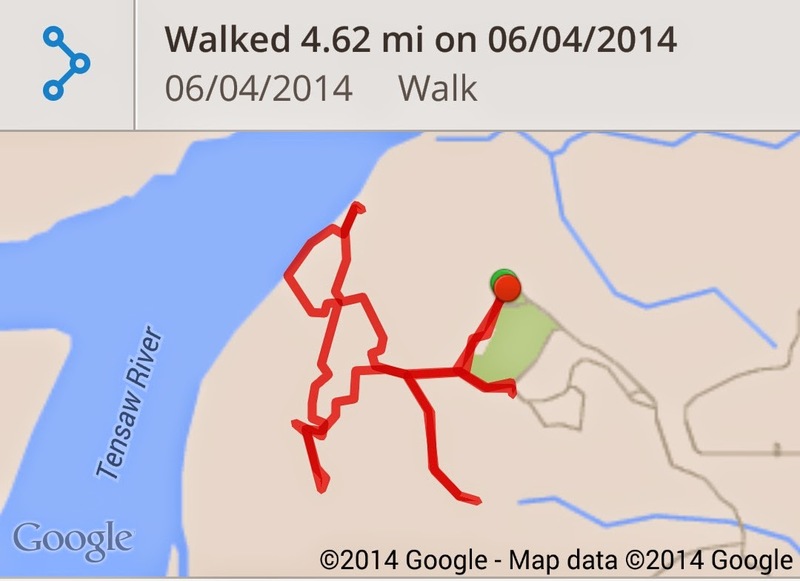 We walked at Blakely Park again, but this time we searched out the Jackson Spring trail. This eventually led us to the Old Blakely Town and down to the river boardwalk. We took advantage of the picnic table at the boardwalk to sit and sip some water and nuts, knowing that there aren't many sitting places on these trails. From the boardwalk, we went in directions we had never been before and were surprised to find a slight elevation change. 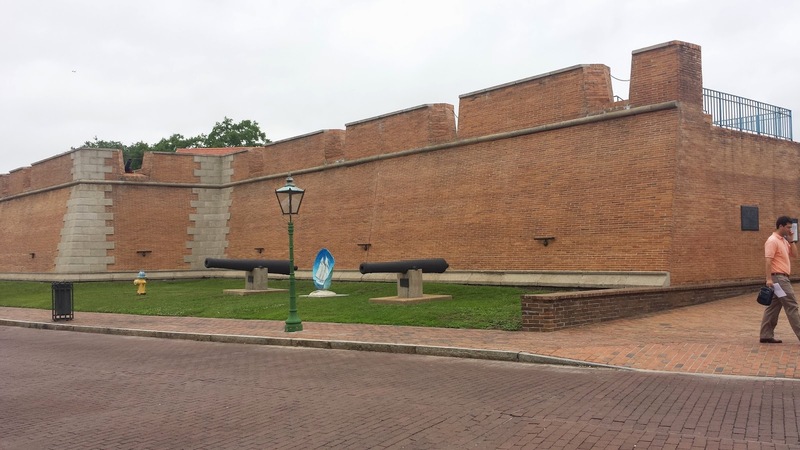 The map only showed it to be 150 feet, but it seemed like much more. The trail wound up and around Jackson Springs (I suppose that's what it was) and the recent rains made it a flowing little spring. At one point we lost the trail (these trails are poorly marked when they are marked) and had to trace our way back. We tried a different approach to mosquito management this walk. Our son, Noah, gave us some Skin-So-Soft that they use in the Marine Corps, and I was amazed at how well it worked. I was also amazed at how oily it was, but it did make my skin feel very soft. I still had the problem of being bitten (bombed is probably a better description considering how these mosquitoes attacked me) where my clothes were. I tried spraying insect spray on my clothes, but it didn't seem to help. So once again I have huge red whelps on my thighs and find myself uncontrollably scratching the horrendous itch they cause. 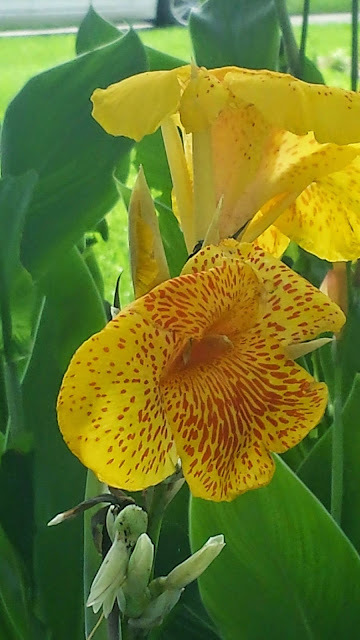 I was very glad I had brought the Frogg Togg because I had to wrap it around my head, covering my ears to keep the insects (it seemed they were the size of hummingbirds) from flying into my ears. This walk was quite intense with its ups and downs. Even though it was early in the morning it was already hot, which only added to the workout. After our walk we went to the Rouse's in Spanish Fort to eat lunch at their hot bar and had the nicest surprise. Their bakery was giving a "sample". . . it was a whole, huge, petite four and it was absolutely delicious. I guess that was sort of our "Trail Magic" for that walk. When we got home we realized our adventure was not over. While I was drying off, I found a tick on my ankle, just where my sock had been. He wasn't really attached, but immediately I had Glen look at the parts of my legs I couldn't see. Then I looked at his. There on the back of his thigh was a big tick! It was really attached, I had to pluck him off, but he came off alive and in one piece. Thankfully Glen hasn't even shown the slightest redness there. When we started off today, I had no idea how long we would be walking. 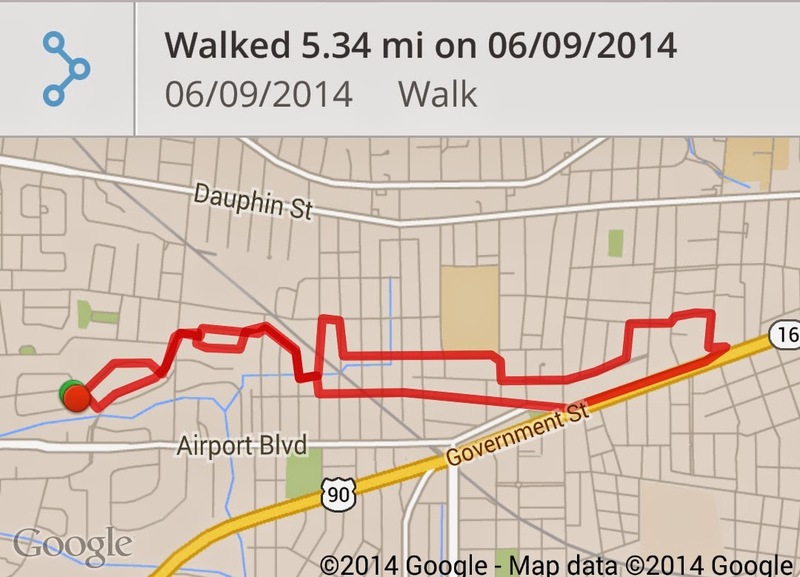 We didn't get a chance to walk yesterday, so Glen decided we would make up some distance today, and we really did. It was a perfect day for it because it was relatively cool when we started out, probably in the mid 70's. Flowers were blooming everywhere and it was just a nice day. There was a nice breeze and the skies were overcast. It basically stayed that way for about 10 miles. 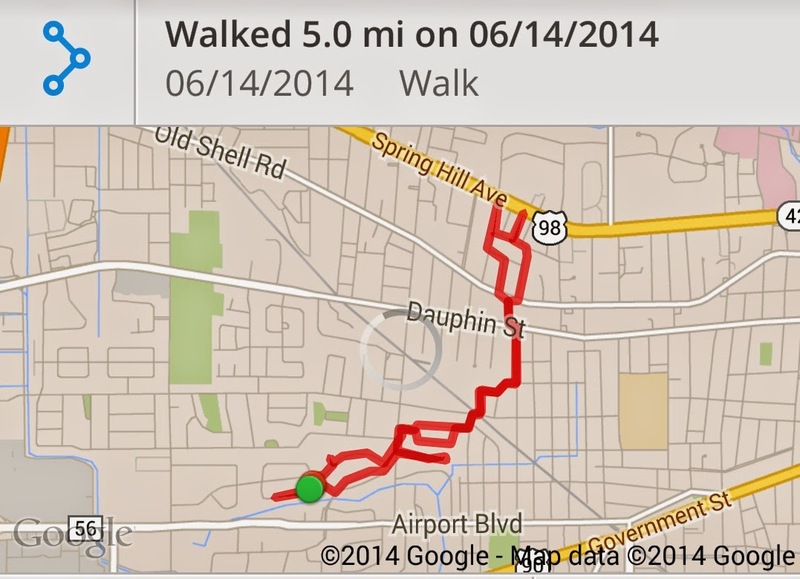 We walked through the neighborhoods, then down Dauphin Street to Water Street. At one point we were walking between the buildings were Marie and Sheldon work, so Glen sent them a text that we were outside their windows. grilled cheese sandwich and a cup of coffee. It wasn't long, though, before we had to pull our legs off those comfy chairs to walk home. By 12 miles I was feeling like we had walked a long time. Fortunately, I took the opportunity to do some good stretches when we stopped for lunch and that helped a lot. The weather forecast was for rain to start at noon, but we never felt a single drop. I would have loved to, though. I saw plenty of water hoses and sprinklers out in lawns, but none were turned on or I would have taken advantage of them! 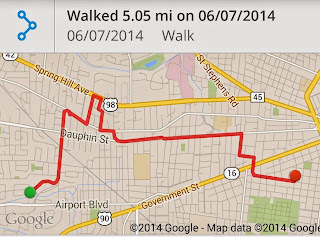 It's nice to have a new record and to start the month of June out with a nice block of miles. May was a relatively low mileage month -- mostly due to the weather-- and I'd like June to be higher.